I've been getting asked a lot of questions regarding the SRV-1 Blackfin that we showcased on CNN so I thought I would post a little info on it. I was putting together a spy segment and was searching around for the a bot that was made for home monitoring. I recalled the Rovio but to my surprise they had stopped manufacturing them (though there are a few still trickling around on the web). I came across Surveyor Corps and that's where I discovered this gem. The SRV-1 is primarily used for research and education utilizing powerful components and a Blackfin processor. 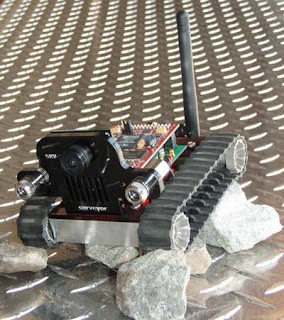 The SRV-1 runs on your network as a virtually controlled webcam and a "self-navigating autonomous robot". You control it using any web browser. It has a camera on its face and you can tap into the feed like a helmet cam. The bot moves incredibly fast sometimes hard to control. I would ideally have liked in my experience to take down the speed which can be easily manipulated. For funs I also enjoyed the dual laser pointers that lay on both sides of the camera. Pretty nifty little robot. You mention that the drive is difficult to control? The blackfin / ARM combo seems pretty powerful...analog devices does a great job with the video encoding... I believe its what quite a few professional realtime HD editor interfaces use. have any idea on what radios theyre using in the lunar hardware tests?